Peter and I spent 4th of July weekend on Orcas Island in Washington State. Pete’s family has been congregating here during summer holidays for more than 50 years. His parents have made their permanent residence on the island for over 15 years. Naturally, they have <img class="alignleft size-medium wp-image-288" title="T 16" src="http://blog.weems-plath.com/wp-content/uploads/2012/07/T-16-225×300.jpg" alt="" width="225" height="300" srcset="http://blog.weems-plath.com/wp-content/uploads/2012/07/T-16-225×300.jpg 225w, http://blog.weems-plath viagra versand.com/wp-content/uploads/2012/07/T-16-768×1024.jpg 768w” sizes=”(max-width: 225px) 100vw, 225px” />been the recipients of many wonderful Conant Functional Home and Garden Decor weather instruments. Two Conant thermometers,the Vermont Grande View Thermometer T-16 and the Vermont Dial Thermometer T-6 are mounted on exterior walls of the Orcas cabin. The Vermont Grande View Thermometer (T-16)is a traditional (liquid filled) mineral spirit tube thermometer while the Vermont Dial Thermometer (T-6)thermometer incorporates a dial, bi-metal coil movement. During the week of our stay, I monitored the readings of each thermometer to see if they registered the temperature similarly. The T-16 is mounted under the eaves of the house on the south side next to the kitchen window and is easily observed from the kitchen sink. The T-6 is mounted under the eaves on the north side of the house and is noticeable from the entry door. Throughout the week I noticed that the temperature readings on the two thermometers varied a few degrees. 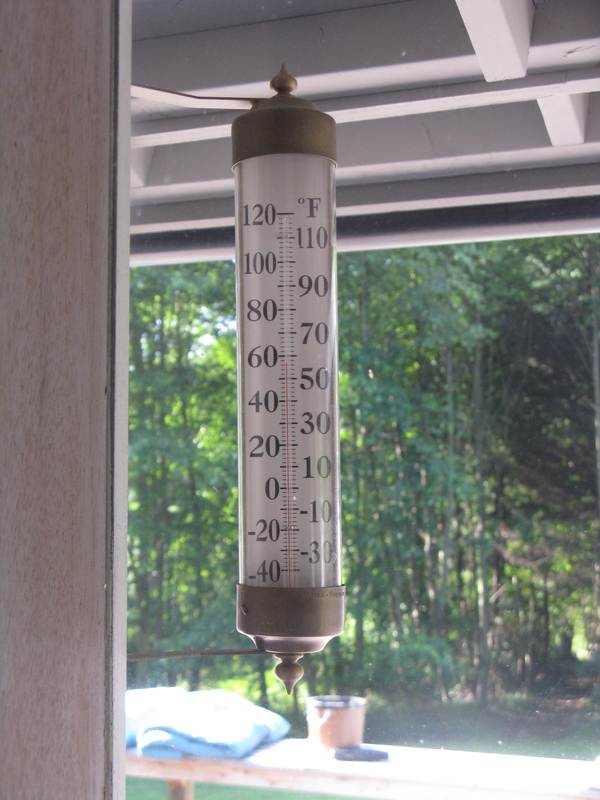 Conant recommends that thermometers be placed in the shade. Both of these thermometers are in the shade all day. What could account for the difference in temperature? One possibility I considered had to do with the fact that each thermometer uses a different technology (mineral spirits vs bi-metal coil), so maybe the temperature varied because of that. But further research uncovered the fact that there are quite a few conditions that can affect exterior temperatures in spaces that might be just a few feet away from each other. The obvious cause of temperature variation is direct sunlight versus shade, but there are other circumstances that contribute to variable temperatures as well. 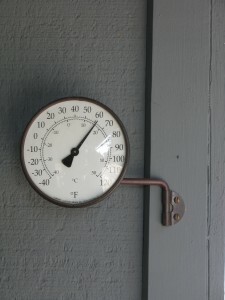 Direction of the wind, heat from nearby reflective surfaces, and the scenario of capturing rising warm air under the eaves in such a way that the thermometer reading is affected. Understanding this, I see that placement of exterior thermometers must be carefully considered. It might be wise to test various locations for best results or as my in-laws have done – mount more than one thermometer.